(Nanowerk News) Researchers in Spain have discovered that if lead atoms are intercalated on a graphene sheet, a powerful magnetic field is generated by the interaction of the electrons' spin with their orbital movement. This property could have implications in spintronics, an emerging technology promoted by the European Union to create advanced computational systems. Graphene is considered the material of the future due to its extraordinary optical and electronic mechanical properties, especially because it conducts electrons very quickly. However, it does not have magnetic properties, and thus no method has been found to manipulate these electrons or any of their properties to use it in new magnetoelectronic devices, although Spanish scientists have come upon a key. Researchers from IMDEA Nanoscience, the Autonomous University of Madrid, the Madrid Institute of Materials Science (CSIC) and the University of the Basque Country describe in the journal Nature Physics this week how to create a powerful magnetic field using this new material ("Spatial variation of a giant spin-orbit effect induces electron confinement in graphene on Pb islands"). The secret is to intercalate atoms or Pb islands below the sea of hexagons of carbon that make up graphene. This produces an enormous interaction between two electron characteristics: their spin - a small 'magnet' linked to their rotation - and their orbit, the movement they follow around the nucleus. "This spin-orbit interaction is a million times more intense than that inherent to graphene, which is why we obtain revolutions that could have important uses, for example in data storage," explains Rodolfo Miranda, Director of IMDEA Nanoscience and head of the study. 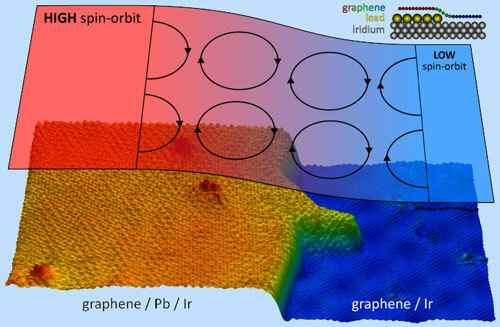 To obtain this effect, the scientists laid a layer of lead on another of graphene, in turn grown over an iridium crystal. In this configuration the lead forms 'islands' below the graphene and the electrons of this two-dimensional material behave as if in the presence of a colossal 80-tesla magnetic field, which facilitates the selective control of the flow of spins. "And, what is most important, under these conditions certain electronic states are topologically protected; in other words, they are immune to defects, impurities or geometric disturbances," continues Miranda, who gives this example: "If we compare it to traffic, in a traditional spintronic material cars circulate along a single-lane road, which make collisions more likely, whilst with this new material we have traffic control with two spatially separate lanes, preventing crashes." Spintronics is a new technology that uses electrons' magnetic spin to store information bits. It arose with the discovery of giant magnetoresistance, a finding which won Peter Grümberg and Albert Fert the Nobel Prize in Physics in 2007. It is an effect that causes great changes to the electric resistance of fine multi-layer materials and has led to the development of components as varied as the reader heads on hard disks or the sensors in airbags. The first generation of spintronic or magnetoresistant devices was based on the effect magnetic materials have on electron spin. But a second generation is already up and running, and encompasses this new study, in which electrons' own spin-orbit interaction acts on them as if there were a real external magnetic field, even if there is not. The use of graphene as an active component in spintronics is one of the fundamental aims of the large European Union project 'Graphene Flagship'. The scientists' final objective is to wilfully control the type of spin the electrons in this new material have in order to apply it to the electronic devices of the future.